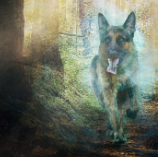 Spark is a character in The Bow of Hart Saga who is based on my two German Shepherds – mainly the male, Sam. This dog has an oddity that I’ve previously shared in that he talks with his tail (click the link for an explanation). He will answer some basic questions by wagging his tail for yes and not wagging for no. Now Sam isn’t always too keen on having a conversation and, after all, he’s a dog and gets easily distracted with, say, things like food and treats. So, I don’t always get a good conversation with the dog but they sometimes turn out humorous and informative. Sam understands quite a lot of conversation. In fact, I think I read in some recent studies that dogs can (not always) understand a lot more of what we’re saying than we think – they even process language the same way (again, feel free to check that if you like). Sam is a little older so he has some aching joints – a few questions and you can find out what ails Sam. In fact, a few years back we were talking and asked Sam if he remembered our old cat, Becky, who died when he was just a few years old. Of course he did (tail wagged furiously). So we asked him if he wanted another cat – and he did! Sam likes cats and babies (really goes crazy about babies) almost as much as swimming! After I asked him if he and the other dog are guard-dogs, he answered yes to both of these. Then I asked Sam if Chloe was a better guard-dog than him. Wow, that was an unusual answer but Sam really doesn’t have much guile so he was just answering truthfully. After I asked the dog if he liked our new cat, Minou, and got the affirmative, I asked if he wanted the cat to go outside. Sam doesn’t want the cat to go outside? That was odd but then I suppose he would really worry about the cat. Then I asked Sam if the cat was his pet. So, Sam doesn’t want his pet cat to go outside. And there you have it, an impromptu interview with Spark about what he thinks about a few things that matter to him. These were really funny and surprising facts to learn – just like when we found out he even wanted a pet cat. Now we know our dog has a cat! This is the second of several posts revealing more about characters from The Bow of Destiny. You can read about Athson here. If you like dogs, you’ll love today’s post! Spark was a rather interesting and late addition to The Bow of Destiny. You see, Spark is a dog but not just any dog. He’s a dog that only Athson sees while he’s not taking doses of his elven medicine, Soul-ease. 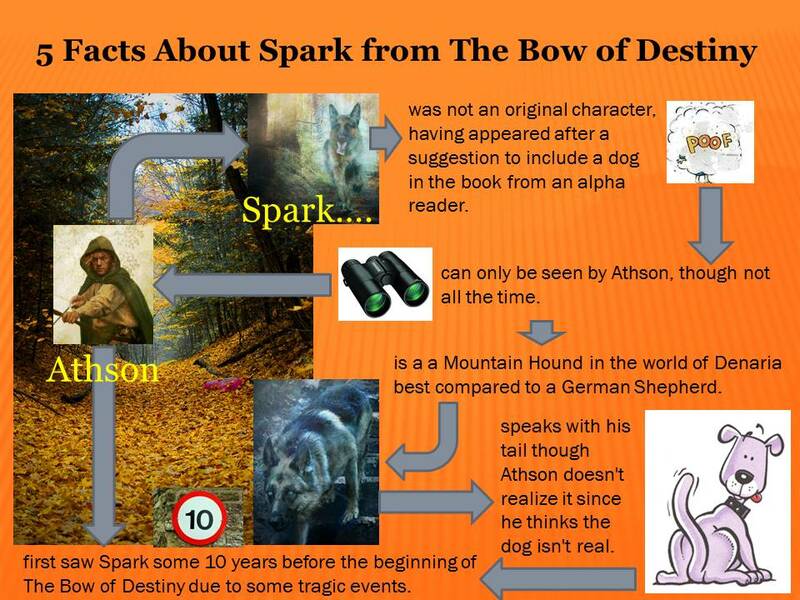 You might wonder if Spark is real and so does Athson. However, Athson considers Spark an old friend who watches out for him. The idea for this invisible dog came from my daughter who did some alpha reading on the book last year. She suggested adding a dog so Spark is what I came up with. 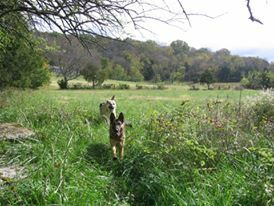 In the book, Athson identifies this dog as a Mountain Hound but to you and me he’s a German Shepherd – or very much like one. If you’ve read my bio you know we own two German Shepherds so you can guess the origin of this character. But there’s more to the characterization than just being like a common breed. Spark is actually based on both of my dogs, appearing more like our female, Chloe, while sometimes acting rather like our male, Sam. Sam wags his tail – and it is (or was when this happened). Sam wags his tail because he really doesn’t like the hot Alabama summer but thrives in what cold weather we have. Sam doesn’t wag his tail because, while he likes cold weather, he prefers to stay near his people like most GSDs do. This question is one that’s meant to ensure he’s really answering rather than just wagging his tail in distraction. No wag because Chloe can really pesters him and bites him often since she’s rather feisty. Sam wags his tail. Funny thing about dogs is that, being like wolf puppies, the males often let females win. Sam is much larger but always lets Chloe win. Sam wags his tail. Yep that’s right, Sam wants Chloe to sleep outside while he gets to sleep inside. We often can ascertain if Sam feels sick (he gets colitis) or achy (he’s getting a little older now and is starting to get stiff joints). We even found out that Sam wants a pet cat though this is likely the fact that he actually misses the old cat, Becky, who was still alive when Sam came to live with us. The cat hated Sam but he loved her. But you get the idea – Sam talks in his own way. He’s rather intelligent that way and even plays tricks on Chloe to get her to do what he wants. Now don’t think that Chloe is dumb by any means. She recognizes aggression easily and can solve some puzzles that Sam just won’t bother with. So guess who speaks Sam-talk? Spark! I have a number of instances where Spark reveals something to Athson about his surroundings that Athson just doesn’t get. But you, the reader, get to understand that Spark may just know more about what’s going on at times than Athson.